By using cardboard, ruler, pen, pin, and yarn, we can measure the height of tree, tower, building, hill, even mountain, without the need to go to objeck and measure directly. Using the principle of two triangles which are having same angles will have same sides length. 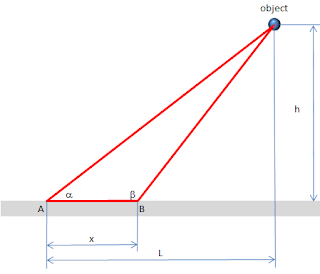 See the above red triangle, if angle a and b are known, and distance x is also known, then the object height h and the distance L can be calculated. 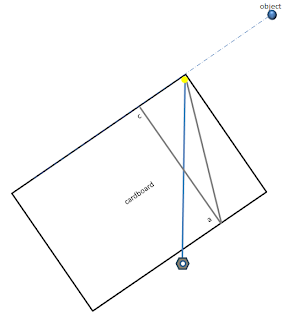 The method described here does not use a formula that calculates angle. If we can draw a similar but smaller triangle on paper then the length of all sides of the triangle on the drawing are proportional to the actual triangle sides. nut for load, or : bolt, pen, etc. 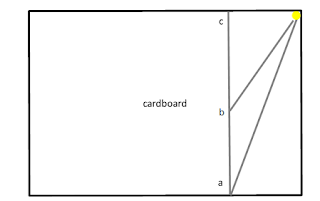 Prepare a plain piece of cardboard measuring about 20 x 30 cm, cardboard is used because paper not stiff enough. Can use the paper but should be attached to a board or on cardboard to make it rigid. 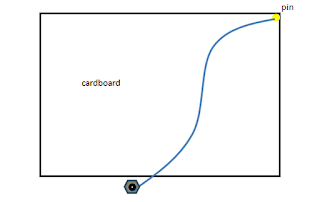 Attach a nail at one corner of the cardboard, make sure it really close to the edge of cardboard corner. Tie a nut with yarn, tie the other end of yarn to the pin on cardboard corner, as shown below. 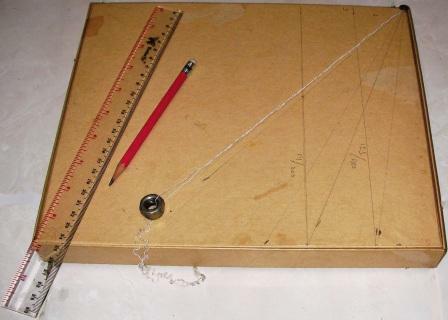 Photograph below shows a cardboard box, ruler, pencil, yarn, pin and nut that I use. Determine a position, name this position as A. 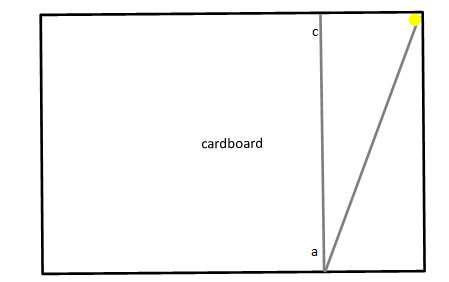 At point A, aim the upper edge of cardboard towards high object to be measured. Let the nut hanging on the yarn. 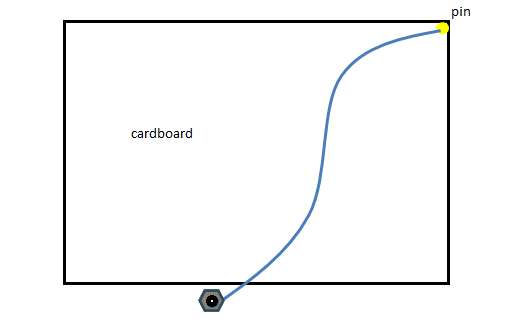 Because of gravity, the yarn and the nut will always point to the center of the earth, so it will form an angle between the edge of the cardboard to the yarn, with a pencil and a ruler draw the line formed by yarn and nut on cardboard, make sure this line connets the nail to cardboard edge. 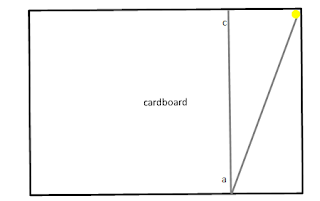 Mark point of intersection of the line that made by yarn with bottom edge of cardboard, name this point as ‘a’. Measure the distance of point ‘a’ to the right edge of cardboard, mark the upper edge of cardboard with the same distance as point ‘a’, name this point as c. Pull a line from a to c, thus forming a right triangle as shown below. Get closer to the object. Measure the distance, this distance will determine the scale on the drawing. In the red triangle picture above, this distance is called x. Remember this path must be really towards the object base, but no need to get until object base. Call this point as point B. 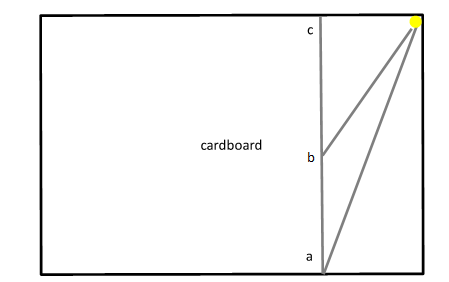 At point B, aim the upper edge of the cardboard towards the object. The nut will be hanging on the yarn and pointing to the center of the earth. Mark the line of yarn on cardboard with pencil and ruler. Make sure the line starts from pin and stop at the intersection with the a-c line, call this intersection point as b. Then we will get triangles as shown below. 20 cm x 500 = 10,000 = 100 meters. Hi there! I was pleased when I loaded this web page of your portal. What was the biggest aim at that moment when you decided to create your website? I like to share my knowledge. 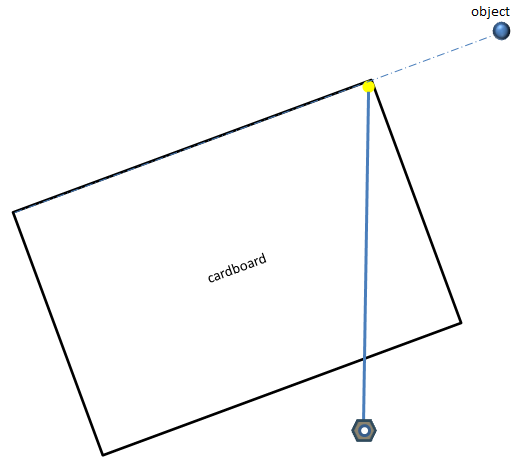 Also, I have an idea to measure height by geometry with cardboard as tool. An idea will not be developed well if only used by its inventor. So, it would be better if I share that idea to help people who need to measure height from a distance with a very simple tool. This invention also can be used as a tool to learn geometry, it can help students to be enthusiastic to learn.